The spacecraft lander is a protective "shell" that houses the rover and protects it, along with the airbags, from the forces of impact. The lander is a strong, lightweight structure, consisting of a base and three sides "petals" in the shape of a tetrahedron (pyramid-shaped). The Lander structure consists of beams and sheets that are made from a "composite" material. Composites such as fiberglass are made of strong fibers or fabrics that are stiffened with a glue, or "matrix". The lander beams are made out of carbon-based layers of graphite fiber woven into a fabric, creating a material that is lighter than aluminum and more rigid than steel. Titanium fittings are bonded (glued and fitted) onto the lander beams to allow it to be bolted together. The Rover is held inside the lander with bolts and special nuts that are released after landing with small explosives. The three petals are connected to the base of the tetrahedron with hinges. 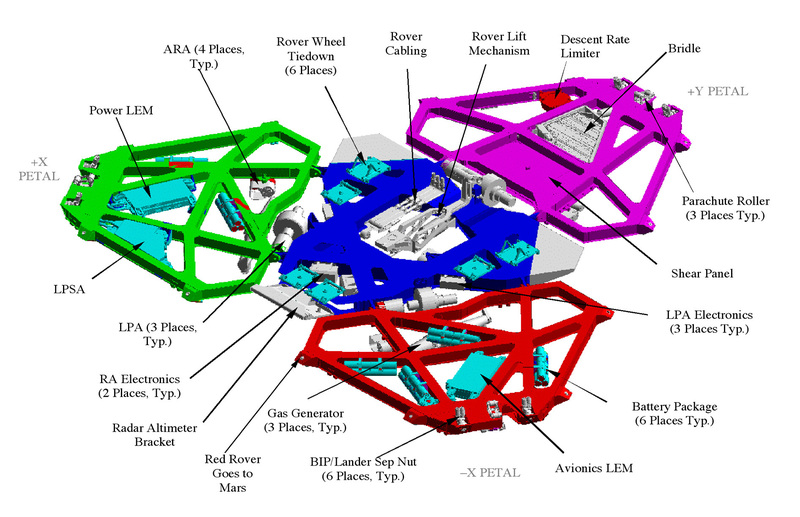 Each petal hinge has a powerful motor that is strong enough to lift the weight of the entire lander (The Rover plus Lander is about 530 kilograms, which would weigh almost 1,200 pounds on Earth but only 437 pounds on Mars. The Rover alone is 170 kilograms, weighing 375 pounds on Earth and 140 pounds on Mars.) 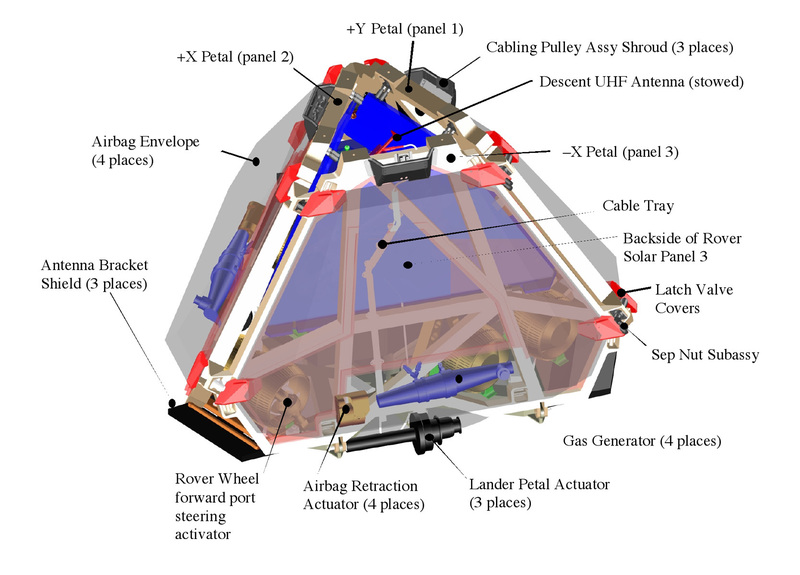 Having a motor on each petal ensures that the lander can place the rover in an upright position no matter which side the lander comes to rest on after the bouncing and rolling subsides on the surface of Mars. The Rover contains sensors called accelerometers that can detect which way is down (toward the surface of Mars) by measuring the pull of gravity. The Rover computer, knowing which way is down, commands the correct lander petal to open to place the rover upright. Once the base petal is down and the rover is upright, the other two petals are opened. The petals initially open to an equally flat position, so all sides of the lander are straight and level. The petal motors are strong enough that if the two outer petals land on rocks, the middle petal with the rover is held in place like a bridge above the surface of Mars. The middle petal holds at a level even with the height of the petals resting on rocks, making a straight flat surface throughout the length of the open, flattened lander. The flight team on Earth may then send commands to the rover to adjust the petals to create a better pathway for the rover to drive off of the lander and safely move onto the Martian surface without dropping off a steep rock. The process of the rover moving off of the lander is called the egress phase of the mission. The rover must be able to safely drive off of the lander without getting its wheels caught up in the airbag material or without dropping off a sharp incline. To aid in the egress process, the lander petals contain a retraction system that will slowly drag the airbags toward the lander to get them out of the path of the rover. (This step is performed before the Lander petals are opened.) Small ramps or "ramplets" are also connected to the petals, which fan out and create "driving surfaces" that fill in large spaces between the lander petals. These ramplets, nicknamed "Batwings," are made out of a strong Vectran cloth, which is similar to the Kevlar used in bullet-proof vests. The "batwings" help cover dangerous, uneven terrain, rock obstacles, and leftover airbag material that could get entangled in the rover wheels. These Vectran cloth surfaces make a circular area from which the rover can roll off the lander, providing additional directions the rover can leave the lander. The ramplets also lower the height of the "step" that the rover must take off of the lander, preventing possible death of the rover. If the rover banged its belly on a rock or smashed into the ground as it was moving off the lander, the entire mission could be lost. About 3 hours is allotted to retract the airbags and deploy the lander petals.